Two officers and six men of the 1st Life Guards served in the campaign in Natal to relieve Ladysmith, all earned the Relief of Ladysmith clasp but only two, Lt JS Cavendish and Trpr T Pearce, the Tugela Heights clasp. A civilian groom also earned these two clasps. Only one squadron of the 1st Life Guards was sent fight in a composite Household Cavalry regiment composed of a squadron each from the 1st and 2nd Life Guards and the Royal Horse Guards. They arrived at the end of December 1899 and were posted to the Western Front. What was this group of eight men doing away from their regiment on the other side of south Africa? Cpt HC Keith-Fraser was Cpt and Adjutant attached South African Light Horse (SALH) with his servant Trpr JJ Nye. 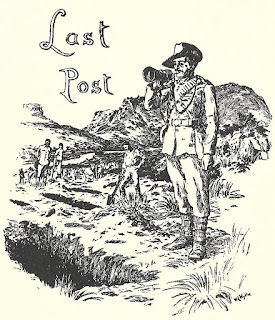 Cpt Keith-Fraser was appointed assistant Press Censor at the Cape in October 1899. Obviously he wanted to fight and secured himself the adjutancy with a premier colonial unit, the SALH. However, Keith-Fraser returned, probably invalided, to England in January 1900. In April he was appointed a Special Service Officer for service in South Africa but it does not appear he returned to the front as his name does not appear in the Shipping Lists published in The Times. Keith-Fraser is on the March 1901 census at the barracks at Windsor. Trpr Nye has not been traced on the 1901 census. Lt Lord JS Cavendish was a Special Service Officer sailing on the SS Moor with Trpr Pearce (at least) on October 21st, 1899. Cavendish had been appointed Divisional Signalling Officer, 2nd Division (Major-General CF Clery), Natal Field Force. It would seem most likely that the other troopers were involved in signalling too, but no evidence has been found to support this. Papers have been traced for Clark, Collett, Grayson and Pearce, none indicate any training in skills such as signalling for which a soldier would have been employed extra-regimentally. On Trpr Pearce’s discharge in 1903 his “Special qualifications for employment in civil life” is “Valet”, perhaps he was Lt Cavendish’s servant. Brown, Clark, Collet, Grayson earned the Paardeberg clasp, to qualify they had to be within 7,000 yards of General Cronje's final laager, or within 7,000 yards of Koodoe's Rand Drift between 17-26th February 1900. The Household Cavalry regiment was present at Paardeberg. Meanwhile Lt Cavendish, Trpr Pearce and civilian groom W Head qualified for the Tugela Heights clasp; they were employed in the operations north of an east and west line through Chieveley Station between the 14th and 27th February. It is most likely they were present for the actual relief of Ladysmith on February 27th. Pearce probably accompanied Cavendish and Head to the Western Front, but was struck down with enteric fever and separated from Cavendish. Pearce was in hospital in Bloemfontein on March 10th, moving south to hospital in Norval’s Pont in July and invalided to England aboard the SS Gascon which arrived back in August 1900. Pearce is on the March 1901 census in the barracks at Windsor. Lt Cavendish was mentioned in despatches (08-02-1901) and awarded the DSO (19-04-1901) for his work in South Africa. Cavendish was attached the West African Field Force from 1907 to 1910. He was killed in October 1914 in France. Robert Pearce was born in Laleham, Middlesex, his father was an agricultural labourer which was Robert’s job before enlisting. He took his discharge in 1903 after 21 years (and no LSGC apparently). On the 1911 Census he is the landlord of the Crown Hotel, Cookham, Berkshire, the pub still operates under the name of the Crown Inn. He enlisted in 1915 at the age of 52, landlord of The Duke of Wellington, Peascod St, Windsor (near the barracks), the pub does not exist today. He enlisted in 1915 into the 1st Life Guards and served for four years, home service only. 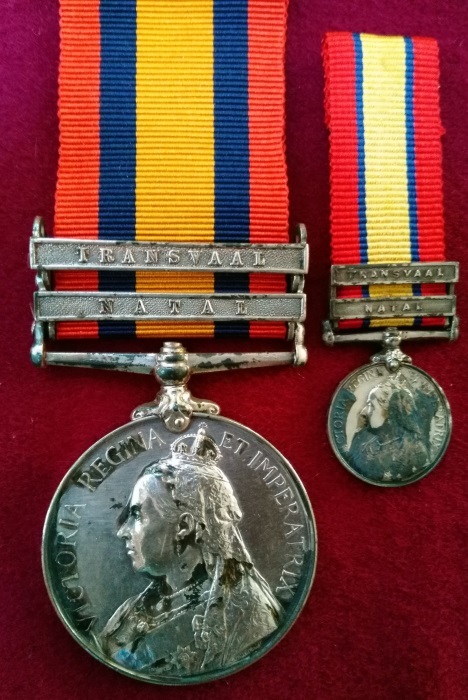 I have in my collection an Anglo-Boere Oorlog medal to a Sergant-Major Freidrich Traugott Mauchle of the Transvaal Staatsatillerie. Mauchle was one the few professional soldiers in the Transvaal and was most likely German or Swiss. He fought on the Natal Front from October 1899 and later in the Transvaal. In the National Archives London amongst the papers in CO 417 - Colonial Office: High Commission for South Africa, Original Correspondence there is printed document Translations of Boer Documents by the Director of Military Intelligence, South Africa. Item 9 is the Translation of Diary of Sergeant-Major Mauchle of State Artillery, the diary is identified as Diary No. 3 pieces 1 and 2 are noted as missing. Mauchle was taken prisoner at Zusterhoek, Transvaal on 26 October, 1901. No doubt this was where the British got his diary which covers the period 15 July to 24 October, 1901. I have long wondered what happened to Diaries 1 and 2. Reading around on a different topic I was surprised to find a direct account of Mauchle's capture with some amusing detail. In Jim Wallace's account of the Canadian Scouts Knowing No Fear he relates that Mauchle was captured by the Canadian Scouts. When Mauchle arrived at the PoW camp in Pretoria he wrote to the camp commander complaining that he and his comrades had been robbed of their money and his diary had been taken. Mauchle maintained that a major of the Canadian Scouts took their names and amounts of money taken promising the money would be returned when they reached the PoW camp. The camp commander passed the details onto the Provost Marshall who wrote to Major CJ Ross, Canadian Scouts. Major Ross replied he would have forwarded the money "had he known the whereabouts of these men". It would be interesting to know if the Canadian Scouts had taken all three of Mauchle's diaries and parts 1 and 2 somehow got lost in transit to Military Intelligence. In January 1902 Mauchle was sent to Deadwood Camp on St Helena, it is not known when he returned to South Africa. After the war Mauchle went to work at the Daspoort Bacteriological Institute and Laboratory in charge of the library and stock records. The Institute was led by Arnold Theiler (from Switzerland) who pre-war served as a Transvaal government veterinary surgeon. In 1898 Theiler set up the Daspoort Institute. During the war Theiler served as veterinary surgeon to the Staatsartillerie and perhaps where he first met Mauchle. In 1901 the British allowed Theiler to continue his important research at Daspoort. Mauchle married Mathilde Henriette (nee Stohr) who died in 1925. Nothing more is known of Mauchle. The casualty rolls show Pte 4981 (sic) J Hood 2nd Dragoons died of exposure at Dorsfontein (sic) April 25th, 1902. Exposure is not an uncommon cause of death - the climate in South Africa can be harsh - not just heat and dust but rain and freezing temperatures were common place. 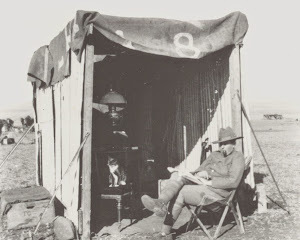 In the field men usually did not have tents and often slept in wet clothes under a single blanket. Often the blanket was frozen solid in the morning. Was Pte Hood a victim of the climate? Reading around we find from the most unlikely sources the circumstances of his death. Currently I am researching the Royal Artillery Mounted Rifles (RAMR). In about 1905 Colonel TS Baldock RA wrote a short history of the RAMR for the Royal Artillery Institution. Today this monograph is very scarce if not rare, there are no copies in the British Library or other lending libraries in Britain. The copy held by the RA Library is now in store. There was only one copy available to purchase. On page 471 Baldock relates how, on April 24th, a patrol of the RAMR came across a "naked and nearly dead" soldier in a burnt out farmhouse in the area between Pretoria, Elandsfontein and Balmoral. The soldier was "too crazy from starvation and exposure" to give a full account. However, his rescuers ascertained he was from the 2nd Dragoons and had been captured and stripped as was common. However the Boers abandoned him in the shell of the farmhouse with no food. The man the RAMR rescued was Pte Hood, the RAMR camp was at Dorstfontein. The casualty rolls do not show Pte Hood being captured. Turning to The Times they record Pte 4991 W (sic) Hood, 2nd Dragoons captured and injured by a fall from his horse at Irene April 18th. So, Hood had spent six days without food, warm clothing and decent shelter before being found. The RAMR patrol took him back to camp where he died the following day. Soldiers' Effects show John Hood was a miner who had enlisted at Niddrie, Edinburgh on April 30th, 1900. He was unmarried his war gratuity and pay was distributed amongst his father, three sisters and a brother. The Somme is "the battle" of World War One. Most people only know the first day - the 1st July. The battle itself lasted until 18th November, 1916. By the 1st July, 1916 the British Expeditionary Force with many veterans of the war in South Africa had been decimated. The British forces on the Somme were composed of many thousands of new recruits - the pals battalions. So how many Anglo-Boer War veterans fought on the Somme? We won't ever get a definitive answer, but from the data collected by The Register we can hazard a guess. If you can add to any of these lists - let me know. Pte H Brummage is listed on the Yorkshire Regiment memorial to it's dead for the Anglo-Boer war. However he is not shown in the official casualty roll or on the regiment's medal roll. It is possible he died after the end of the war and did not qualify for a campaign medal. Research shows this not to be the case and reveals a curious tale. Born March 30,1882 in Norwich, Henry volunteered with 4th bn Norfolk Regiment. In February 1901 he enlisted for the Regular Army joining the Yorkshire Regiment, number 6502. Henry served in South Africa from April 1902 and would have qualified for the Queen's South Africa medal, but his name is not on the medal roll. Evidence of his death comes from Army Registers of Soldiers' Effects, 1901-1929 where he is shown as having died at Klip River on June 7, 1902, Henry's war gratuity and other monies owing were paid to his father, Christmas Brummage. His service papers (WO97) show that a court of enquiry found that he was absent without leave "to have committed suicide or been accidentally drowned" at Klip Drift (sic). Then there is an entry for July 1907 where Henry is subject to a court martial. Henry's case made the national newspapers in the UK when he came before civil magistrates in Norwich before being handed over to the Army for court martial. No further detail is given except that his clothes were found on the banks of the Klip and he was presumed drowned. Obviously Henry had planned his desertion and returned to the UK without being detected and managed to live in the UK until 1907. How he was found out is not known.The court martial sentenced him to one year imprisonment with hard labour and discharge with ignominy for desertion.Thirteen days after rejoining Brummage was dismissed on July 22,1907. All former service save for five days from the end of the trial to dismissal was forfeited. The medal roll on which soldier's who arrived in South Africa in 1902 was prepared in 1903, when he had deserted. Undoubtedly the regiment did not enter his name on the roll. In February 11, 1911 Henry married Kathleen Mabel Stone in Norwich. On the 1911 Census, taken in March, they were man and wife with a 14 month old son called Henry, presumably Henry was the father. Henry worked as a general labourer, later he woudl work as a painter. Henry and Mabel woudl have a further three children. On the outbreak of World War I in August 1914 Henry re-enlisted in the 3rd bn Norfolk Rgt, number 8070. He declared his former service and discharge for desertion. He was discharged medically unfit after 93 days service, during which time he had four entries in the defaulter's book for being absent without leave. In April 1915 Henry enlisted for 2/3 East Anglia Field Ambulance, RAMC. In December he transferred to the ASC, later he was posted to the Labour Corps, number 355080, then served with the 2nd, 3rd and 5th bn Bedfordshire Rgt, number 210860. Henry continued to collect numerous entries in the defaulter's book, but he did serve overseas. He was demobilised in March 1918 from the with 20% disability due to rheumatism. For his World War 1 service Henry was awarded the British War and Victory Medals and a Silver War Service Badge. In the depressed post-war economy Henry served again with 2 East Anglia Field Ambulance, RAMC from April 1921 to May 1922. On discharge his character was "good". Henry Brummage died in Norwich in 1960. This research was inspired by Research puzzles - "Odd" casualties from war memorials. George Theodosius Wynne Webb was born 2 March, 1876 in Woolwich (or Charlton) Kent to Capt (retd) John H and Edith G Webb. Cpt JH Webb had served in the 11th Foot and was a Higher Division Clerk in the Admiralty. The family was comfortably off, they had one or two servants recorded in the census. George, one of three sons, was educated at Merchant Taylors School. His two brothers Andrew Henry and William Vere Brandram were commissioned into the RGA. In September 1894, aged 18, George was commissioned into the Royal Marine Light Infantry. His career came to an end just 10 months later in July 1895 when he resigned his commission. His record in ADM196 darkly notes that “confidential reports whilst studying at RN College” were written. Obviously George was in trouble while studying at the Royal Naval College, Greenwich. Determined on a military career George gets a commission in the Royal Jersey Militia RA as a route to getting a commission in the regular army. In October 1897 George secures a commission in the RGA. However, on the 12 July 1899 he leaves the Army, he did not resign or was court martialled. Records at the RA Library simply record he left, obviously by agreement and no doubt to save himself and his family from any shame for whatever transgressions occurred. There is no record in the London Gazette I can find. Having failed twice to embark on a military career George did what many troubled young men did and went overseas. George sailed to southern Africa where war clouds were gathering. George ended up in Ladysmith by October 1899 where he unexpectedly pops up in the Digest of Service for the 10th mountain battery RGA. The 10th mountain battery were stationed in Natal before the war and formed part of Sir George White’s force defending Ladysmith. The Digest records that “Mr Webb (attached)” was among the officers captured at Nicholson’s Nek, "Mournful Monday", 30 October. A hand written marginal note adds “Mr Webb was a civilian”. This ties in with the record from The Times for “Sec Lieut GTW Webb” being released as prisoner of war. Whether George deliberately went to Natal to find former officer comrades is not known. But, he obviously knew the officers of the 10th mountain battery well enough to be allowed to accompany them on their attack. Whether he had a role beyond observer is not known. Like his previous military careers this one, albeit as a civilian, ended quickly and badly; George found himself in the officer’s prison camp in Pretoria for seven months. On release from POW camp George “Left battery on occupation of Pretoria” as recorded on the medal roll. I cannot help think that in the enthusiasm for the first battles against “mere farmers”, George’s participation was evidence that some British officers did not take the war seriously. By June 1900, officers knew they were in a serious fight and there was no place for civilian hangers-on. Perhaps put off by his experiences George appears to get a job with the customs office in Utrecht, eastern Transvaal (National Archives of South Africa). How long he stuck at this is not known, but the lure of a soldier’s life was too strong. On 9 May, 1901 he enlists as Trooper 3783 Steinaecker’s Horse, claiming 5 ½ years’ service in the Royal Artillery. It is very unlikely he saw any active service as his fourth attempt at a military career came to an end just 20 days later. George died of pneumonia in Fort Napier, Pietermaritzburg and lies in the St George’s Garrison Church cemetery with a fine marble cross over his grave “Erected by his Sorrowing Parents”. The epitaph they chose is, I think, emblematic of a troubled soul, “was lost and is found”; from the Parable of the Prodigal Son. George Webb’s QSA is correctly engraved to “Lieut. G.T. Wynne-Webb R.G.A.”, the surname an unfortunate error. His name as “Webb, GT Wynne” is found on the roll for the 10th mountain battery (WO100/146p66) appended in a different hand at the bottom of the list of Lieutenants, he has no rank. 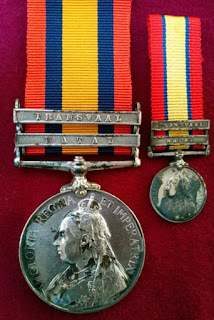 The medal with two clasps (Transvaal and Natal) was issued 9 April, 1902 with a note to correspondence “93883/19”. What it would be to find that correspondence, undoubtedly his parents and/or brothers petitioned the War Office for a medal engraved as an officer, which of course he was not entitled to. George appears on an Extra Clasp roll for Steinaecker’s Horse (WO100/276p168) and again there is some evidence of correspondence. His entry is crossed out and then re-entered with entitlement to the ‘South Africa 1901’ clasp no reference is made to his previous service or the issue of the clasp, which is not on the medal. There is a large asterisk against his name which is unexplained. Not only did George’s family secure a campaign medal but they also got his name entered on the corp's war memorial with the rank he did not hold when he “won” his medal. Perhaps securing these recognitions was justice for the family regarding George’s troubles with the RMLI and RGA. George’s two brothers were Andrew Henry (older) and Willam Vere Brandram (younger) who were both commissioned into the RGA. Andrew served in South Africa on the Western Front and also in WW1 as a Lt-Col. William did not see in any campaign service and emigrated to Canada, he enlisted in the CEF in 1916 for overseas service. I don’t know if he actually served abroad. 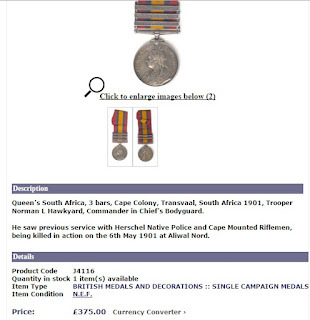 In the Spink April 2016 sale a number of Webb family medals were sold dating from the Peninsula to WWII. All the groups have research apart from the QSA and miniature to Lt GT Wynne-Webb RGA which simply states he was the great great nephew of Sir John Webb whose medals are first in the Webb family lots. 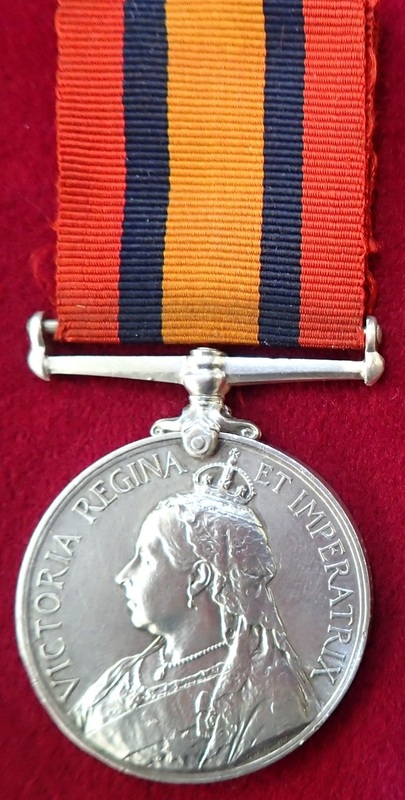 Andrew’s CMG, DSO group was amongst the Webb family medals sold at Spink. This booklet is the first translation into English of part of the memoirs of Russian Army officer Lieutenant Yvengeny Avgustus. He traveled to South Africa in early 1900. 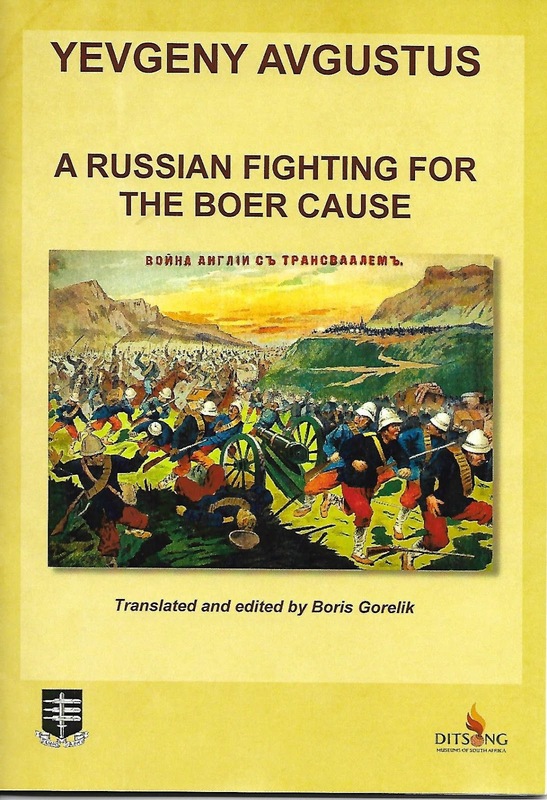 Choosing the Natal front Avgustus relates with clarity his impressions of the Boer army, its leaders, burghers and other volunteers. Seeking action his group joined the Krugersdorp Commando shunning foreign volunteer groups riven with dissent. As part of the Krugersdorp Commando Avgustus fought at Spion Kop - the battle was as hard and terrifying for the Boers as the British and Tugela Heights in February. Three days in a trench subject to artillery, machine gun and rifle fire he marvels at the tenacity of the British infantry, advancing into Boer machine gun fire to close with the bayonet; a weapon the Boers didn't possess and feared. With the British troops upon them Avgustus and a comrade managed to escape leaving many dead and wounded behind. This well written, and well translated tale, ends with Avgustus negotiating the crush of fleeing Boers at Elandslaagte station heading north for safety. There is much of interest in this slim volume and is a good read. Loxton's Horse was a small and little known unit on the British side during the Anglo-Boer War. They were raised for the duration of the war only like many other colonial units. 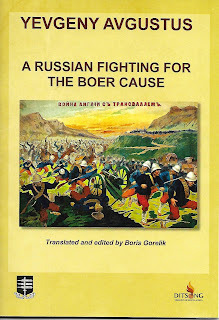 But, Loxton's Horse was one of what were known as “loot corps”, whose purpose was to loot Boer farms – an extension of the concentration camp policy and farm burning. “Loot corps” were authorised by Lord Kitchener, the Commander-in-Chief of British forces in south Africa. “Utrecht district. Today we saw for the first time in this war a looting corps of 28 men called Loxton's Horse. They keep 75% of all they can loot, receiving no pay. This is a big shame as we who have been out 17 months cannot keep a horse, even if we catch them, and these men only follow us when we have cleared the country, like a lot of jackals." There is a medal roll (WO100/268p26) for Loxton's Horse with just two names, Troopers G Tustin and HH Tod. Apparent from the handwriting is that the roll was originally submitted with Tustin's name in 1906 and the medal issued in 1908, no clasps are indicated. The roll was signed by one Sidney W Reynolds “late OC Loxton's Horse” in Newcastle, Natal on 21 June, 1906. Reynolds, like Loxton's Horse, is mystery too – he does not appear on a medal roll, but there are civilian records for him in the National Archives of South Africa as a farmer in Newcastle. Todd's name was added in the same hand that wrote the note that his medal was issued in 1957, unfortunately there is no address shown. Neither Todd nor Tustin appear on any other medal roll for the war. Other member's of Loxton's Horse are known, and a nominal roll has been constructed primarily from the medal rolls where, fortuitously, service in Loxton's Horse has been noted by an assiduous clerk. There are 19 names, perhaps 1/2 of the total who served with the unit. If you come across anymore references to Loxton's Horse, please let me know. Many thanks to Brett Hendey for the references from Coghlan and Andreasen; Ian Linney for references to Cooper, Dorey and Short from Field Intelligence Department 1899-1902 Honours and Awards & Casualties & Medal Rolls - compiled by David Buxton (2004), both via www.angloboerwar.com, Elne Watson for the House of Commons and JM Wasserman's DPhil thesis references from Facebook. In the late Victorian era the "followers" in a military campaign were awarded medals, but in bronze not silver as a cost saving exercise. These men performed non-military menial duties such grass cutting (for forage), ward sweepers, transport drivers, water carriers and so on. Most commonly seen is the India General Service medal 1854-1895 in bronze for the campaigns of the 1890s covered by clasps such as Punjab Frontier 1897-98, Relief of Chitral 1895 and Tirah 1897-98. This practice continued into the Second Anglo-Boer war and bronze medals were awarded to an officer's servant (irrespective of colour). The most bronze medals were awarded to Indians who came across with the very large numbers of white troops stationed in India. No official medals were awarded to the indigenous africans and other non-whites who performed a similar role to the Indian followers and many even bore arms; their story is for another post. Collectors may see on the market a silver QSA named to an Indian in typical flowing script but on the medal roll it is clearly marked they were issued with a bronze medal. Is this a piece of fakery or not? After the war in 1903 the Indian government decided to allow attested followers (except ward sweepers) silver medals. Un-attested and authorised followers ("private followers") were still awarded bronze medals. This change of policy had its roots in the Anglo-Boer War, in May 1902 the Indian government allowed men to exchange their bronze medals for silver ones at their own expense when they enlisted as soldier. The date 1903 is critical as many medals to Indian followers had not yet been issued, therefore technically the new rules could apply to QSAs even though the campaign pre-dated the rule change. Whether this happened is not actually clear. This medal is to M46 Dafadar Pat Ram I(ndian). P(ack). Mule Train. The medal roll was prepared in Cape Town in September 1901, four men, all (Indian) Veterinary Assistants were to receive silver medals with clasps, these were issued in December 1904. For Pat Ram and the remainder it is clearly shown they were to be issued bronze medals without clasps (unlike the issue of the bronze IGS). These medals were sent to India for distribution, no date is shown. One can assume then that Pat Ram received a bronze medal without clasps. So, how did his silver QSA come about? Under the 1903 rules it would appear he enlisted as a regular soldier and purchased a silver QSA. However, the naming is an issue. The great collector and researcher into QSAs and KSAs to Indians, David Grant, has only seen verified exchange medals with impressed naming not engraved. David surmises that Ram's medal with engraved naming might then be a replacement medal, issued after 1903 according to the rules then in force. The Mint in Calcutta did not issue a replacement bronze medal. A number of blank silver QSAs were sent to India, an impressing machine was not sent until 1908. There is clearly more research to be done in this area. If Ram had been issued clasps they would have been Transvaal, Defence of Ladysmith and Laing's Nek. However, he wasn't and his QSA (bronze or silver) without clasps illustrates the joy of collecting QSAs; the hidden facts that come with a bit of research. Many thousands of Boer POWs were sent overseas to camps remote from South Africa, in places like Bermuda, Sri Lanka, St Helena, Portugal and India (and now Pakistan). One of the smallest and short-lived camp was in Kakul near Abbottabad in north-west India, what is now Pakistan. The camp was set up in 1902 and existed for just a few months. One of the noted past-times of the Boer POW was to create handicrafts from whatever local materials they could find, wood, stone, bone and on Bermuda they wove neckties too. These items are highly collectible today. Handicrafts from the bigger camps such as on Bermuda and St Helena are not hard to find, those from smaller camps are rare and Kakul items must rank amongst the rarest due to it's small size and short life. 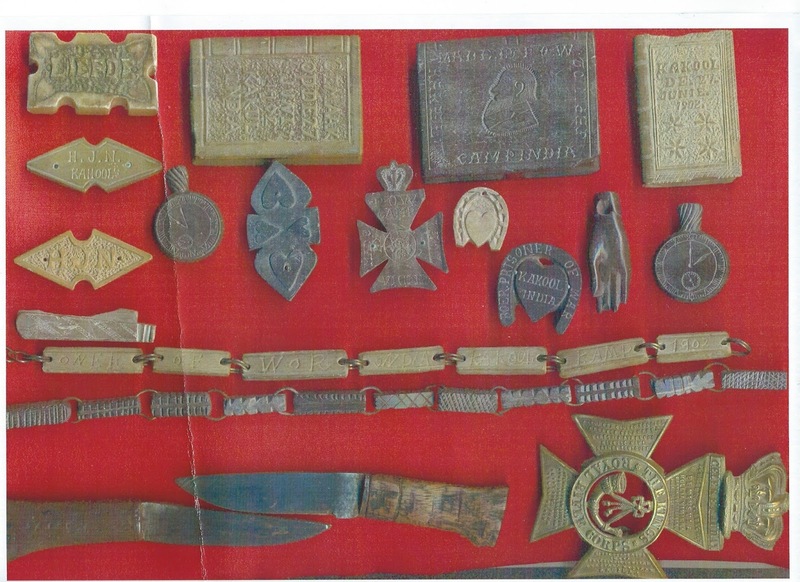 In Pieter Oosthuizen's fabulous book Boer War Memorabilia: The Collectors' Guide (The Alderman Press, 1987) none of the items featured are from Kakul. The War Museum of the Boer Republics in Bloemfontein only have a handful of examples. 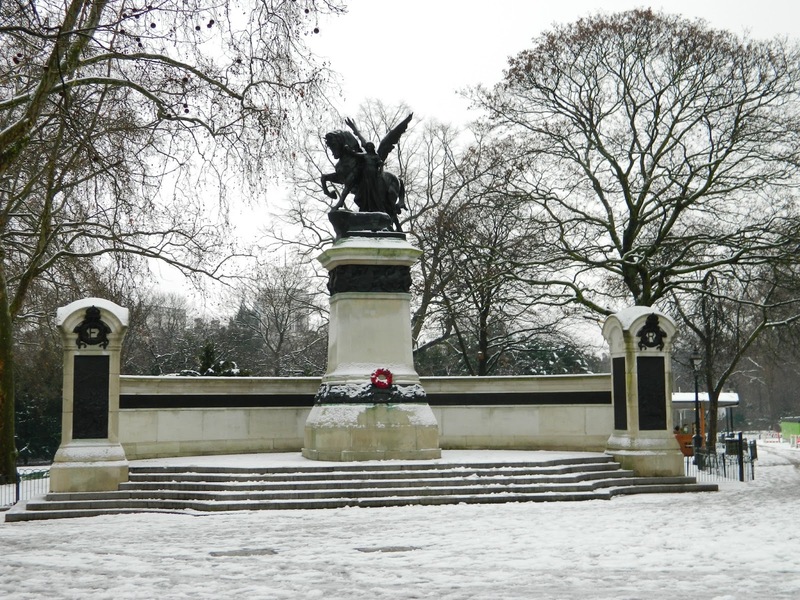 War memorials are a great source of information and supplement the official casualty rolls, they can provide first names, biographical details, exact cause of death and a clue as to where a man came from. However, there are names on war memorials that just don't make sense, they are casualties but just cannot be found in the usual sources. I will write about three examples that I recently resolved as they reveal interesting stories and illustrate the need to "keep digging". 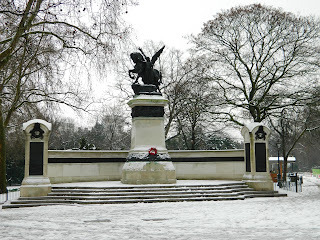 After the war the Royal Artillery erected a large memorial on The Mall in London - just down the road from Buckingham Palace. On the plaques arranged by battery are the names of all the gunners who died during the war. There are two that, until, recently were a mystery: Lts FC Fox and GTW Webb. Neither man in the official casualty roll nor in the November 1899 Army List which implies they weren't serving officers during the war, why then are they on the memorial? On the casualty rolls there is an entry for a Trooper Francis Charles Fox, Border Mounted Rifles, the only similar record to Lt FC Fox RA; what if any is the connection. This research was resolved quickly by contacting the Library of the Royal Artillery. There records show Lt FC Fox was killed while serving as Captain with the Border Mounted Rifles. He was commissioned into the Royal Artillery in 1869 and resigned his commission in 1879. When he was killed at Caesar's Camp on January 6th, 1900 he was quite old for a trooper, fifty perhaps? I double checked his rank with a Border Mounted Rifles collector in South Africa and he was not a captain. Exactly how his name was added to the RA memorial is not known, but he had not served with the regiment for 20 years on his death. There must be other ex-gunners killed in the war who are not included. There is certainly a story to be uncovered on what Fox did between 1879 and 1900. The Register, being an agglomeration of records from many sources, had a record for a GT (George Theodosius) Wynne-Webb, 2nd Lt RGA and Trooper Steinaecker's Horse who died May 28th, 1901 at Pietermaritzburg, previously a prisoner released June 6th, 1900 at Waterval. This last record comes from The Times and is not in the official casualty roll, he is described as "attached" to the RGA. Obviously there is a great similarity between GTW Webb and GT Wynne-Webb, but what is the connection between the two records? A name like "George Theodosius Wynne-Webb" is ripe for internet searching, and so it proved. GTW Webb was born in 1876, educated at Merchant Taylors. He was first commissioned into the Royal Marines in 1894, resigned at his own request in 1895. His service record (ADM196/62/304) refers to "confidential reports". He then joined a militia unit, the Royal Jersey Artillery from which he was commissioned into the RGA in 1897. He left the RGA in July 1899, circumstances unknown. Almost immediately he sailed for southern Africa and on the outbreak of war was in or near Ladysmith where he became attached to the 10th mountain battery RGA. The Digest of Service for the battery describes him as "Mr Webb", hence The Times describing him as "attached". How this relationship came about is not known, perhaps he had pals in the battery who invited him along. Whatever the nature of the relationship "Mr Webb" accompanied the battery into battle on "Mournful Monday" and was captured in the ensuing debacle on October 30th, 1899. On his release from POW camp Mr Webb did not re-join the battery but instead turns up in Utrecht, eastern Transvaal employed at the customs office. On May 9th, 1901 he enlists with Steinaecker's Horse as Trooper 3783 but dies three weeks later of pneumonia. The connections that saw him attached as a civilian to the 10th mountain battery RGA persist after his death, his name is included on the RA memorial despite him not being a serving officer at the time of his death and his brief, and perhaps chequered, career when he was commissioned. As ever, "worthy of further research" - see this blog. The third example is Quartermaster & Honorary Captain EJ Piper 1st volunteer battalion King's Shropshire Light Infantry (KSLI). He is named on the Devonshire county memorial in Exeter Cathedral, but not the (KSLI) memorial in Shrewsbury which implies Piper did not die on active service with the KSLI. On the medal roll there is a record for a Lieutenant & Quartermaster EJ Piper 5th bn Imperial Yeomanry (IY), roll marked "deceased". His name is not in the official casualty rolls suggesting he died in the UK, but what are the connection between a man from Devon, the IY and the KSLI? With no first names and a surname like 'Piper' there is not much to search on. Fortunately FindmyPast have uploaded a huge archive of British newspapers which are treasure trove for researchers. Experimenting with different first names "Edwin Piper" drew a direct hit. His obituary was published in the Western Times (Devon) on December 21st, 1900, and full obituary it is too. Edwin Piper was born about 1841 in (or about) Exeter. He served for 30 years with the volunteers, the last 16 with the 1st vb KSLI and as Supply and Transport Officer, Welsh Border Brigade. On the otubreak of war he was offered the role of Supply and Transport Officer for the 5th bn Imperial Yeomanry, one company of which came from Shropshire. In South Africa he fell ill with dysentery and enteric and was invalided home. He had two operations in July, but never recovered. He left a widow and six children. He was a deacon in the United Methodist Free Church, Albert St. I will continue to work through the "odd" casualties on war memorials, one that I am working on know is Lt SP Knowles, formerly 2nd Life Guards. So far I cannot find any likely casualties with which to work on; one day all will be revealed. International History Conference: From the Anglo-Boer War to the Great War at Talana Museum, Dundee, Kwazulu-Natal October 2014. Research for this paper has added 200 memorials to The Register - with more to come. Another example of conflicting casualty information but this one is plain weird as the two pieces of information are wildly different. Norman Lewis Hawkyard served as Trooper 26371 Commander-in-Chief’s Bodygaurd (he had previous service with the Cape Mounted Rifles, discharged “worthless character” and as a Corporal Herschel Native Police). The South African Field Force casualty roll shows he died of disease at Charlestown, Natal on May 6th, 1901. The Times (surname spelt Hawkeyard) confirms this adding that he succumbed to enteric fever. The medal roll and the nominal roll (WO127) show very clearly that he was killed in action at Aliwal North, Cape Colony on May 6th, 1901. Which is correct? The two locations are a seven hour drive apart, so the location and cause really are in conflict. To resolve this we have one other source to consult: In Memoriam (Steve Watt, University of Natal, 2000). This is a marvellous reference work showing the burial location of thousands of Anglo-Boer War fatalities. The entry for Hawkyard show he is buried in Newcastle, Natal just 45 minutes away from Charlestown. With this evidence it is more likely Hawkyard died in Natal rather than the Cape Colony, and he succumbed to disease. There was no fighting in this part of Natal in May 1901 (or in Aliwal North for that matter). Where does the killed in action information come from? It is impossible to tell. 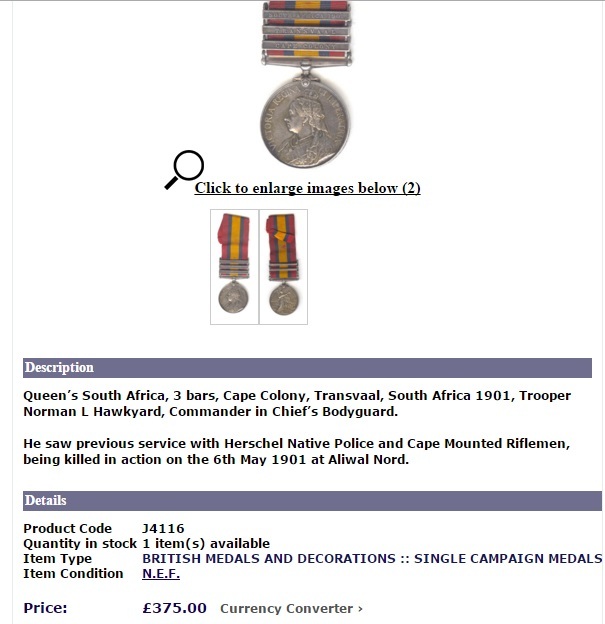 Hawkyard’s QSA medal is currently for sale with LiverpoolMedals, who may have acquired it from eBay where it was offered for sale in December 2015. Worryingly Liverpool Medals choose to state that Hawkyard was killed in action and ignore the died of disease stated in the casualty roll. I did write to them with this information, which they have ignored. The premium for a killed in action is higher than that for a died of disease. The Last Post was compiled in 1903 by Mildred Dooner to commemorate the officers who died during the Anglo-Boer War. These officers “died heroic deaths” and it was her aim that their memory should not “fade into oblivion”. Dooner, the daughter of Colonel WT Dooner, compiled her information from a variety of sources; casualty lists, memorials and correspondence. Dooner recognises her list may not be entirely accurate. There has been no revision to The Last Post until now using the updated casualty roll in The Register. Dooner also included two appendices one for nurses and the other for war correspondents. Nurses are an obvious choice and were beloved by the officers and men, it was the nurses who endeavoured to keep the sick and wounded alive. The war correspondent is a somewhat odd choice as these men (and one woman) merely reported the war, they did not fight or help the sick and wounded. Indeed many officers did not like war correspondents, they resented their quest for information and many thought their reports biased and unhelpful. Although some senior officers manipulated the press. However, this information exists nowhere else, modern day researchers must be thankful to Dooner for this anomaly. To revise Dooner I have checked every entry in her book against the casualty rolls and a variety of other sources but primarily the medal rolls, war memorials and The Times newspaper. I have verified 1,159 entries, these include 14 war correspondents and 10 nurses. Unfortunately a number of errors and inaccuracies have crept in. There are three duplicate entries: Betty/Kemmis-Betty, Birch/Burch, Chapman/Clapham. Dooner has included four officers who died after the war but not from related illness or wounds. Another, FE Hancock, was not apparently serving when he died of enteric fever in 1902. 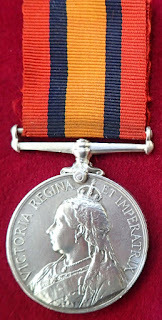 The Official Casualty Roll shows him as a civilian and the medal roll indicate he was entitled to the “South Africa 1902” clasp. It is not clear if Hancock was serving the military in a civilian capacity. Dooner does include one civilian, Mr F Chapman, a farmer, was a guide to the British forces attacking Willow Grange (23-11-1899) when he was shot dead. Two men were not commissioned officers when they were killed, G Falcon and A Spencer (Cape Medical Staff Corps) and there is no indication they were about to be commissioned. The unit for Lt AG Warren is incorrect, he was in the Cape Police not the Cape Mounted Rifles. For the vast majority Dooner has given the exact cause of death, “enteric” instead of “disease” as often seen in the Official Casualty Roll. However, for some the exact cause is not shown which may be to protect the sensibilities of the family. Lt HG Berghuys, Kitchener’s Horse “died of wounds..in Feb., 1901”, in fact he was murdered by Trooper F Carpenter in a row over leave in November 1900. Trooper Carpenter was executed. Four officers committed suicide (as per Official Casualty Roll), others died of self-inflicted wounds. Cpt MMD Morrison according to Dooner died of asthma, the Official Casualty Roll shows “Died of wounds Revolver, self inflicted”. There is one man listed who I cannot trace in any source as a fatal casualty: Captain EB Muller, Kaffrarian Rifles killed at Ramathlabana 31-03-1900 with Colonel Plumer’s column during the relief of Mafeking. There was a Captain EB Muller, Kaffrarian Rifles who survived the war, he was not involved in the relief of Mafeking neither were the Kaffrarian Rifles. Then there is the case of Lt WBM Carruthers, Canadian Mounted Rifles. Carruthers was widely reported as being killed at Brakspruit March, 3rd 1901, naturally Dooner picked this up and included him in The Last Post. Carruthers was not killed in the war, but died in 1910 from tuberculosis apparently contracted on service in South Africa. As to the omissions from the The Last Post I have traced 22 officers, one war correspondent and 20 nurses who died in South Africa during the war. Of the 22 officers 16 are from colonial units, a group Dooner admitted having difficulty finding information about. I have also included in this group Captain HH Morant, Bushveldt Carbineers, who was executed by the British for murdering Boer civilians. Dooner may have deliberately left him out. The additional war correspondent turns out to be the most interesting WH Mackay. Mackay, from Scotland, was a newspaper editor in Pretoria and Reuters agent at the outbreak of war. He remained in Pretoria and handled the telegraph communications between Winston Churchill when he was a prisoner and his mother, Lady Randolph Churchill. Mackay is also credited with breaking the news of the relief of Mafeking to Britain. News of the relief reached Pretoria on the same day, May 17th, Mackay bribed an engine driver to take his despatch to Lourenco Marques in Portuguese East Africa where it was sent on reaching Britain the next day. He died suddenly in Pretoria in July 1900. I have traced information on his death to a notice in the Dundee Evening Post, July 21st. Mackay is on the War Correspondents memorial in St Paul's Cathedral, London and on the War Correspondents medal roll, but is not shown as deceased. A further 25 officers and two nurses died outside of South Africa or after the war in South Africa. Dooner has been re-printed in book form and electronically (for free), one version can be found here. Dooner's text has also been included uncritically on various websites which will only serve to mislead the unwary.